We will start off by visiting the O Rosal valley a sub-zone of the D.O. Rias Baixas. Here they make fabulous Albariño wine as well as the local Rosal wines which are a blend of different local grape varieties including Albariño. As well we will try the new Caino monovarietal wine which is getting rave reviews! 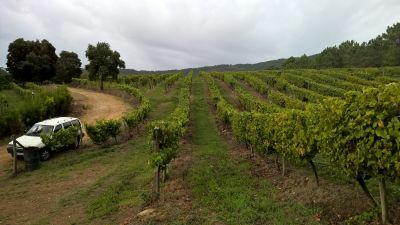 We will take a detailed tour of one of the most important wineries in the area and try the difference between the 2 or 3 types of wines they make in this region. Then we will following along part of the rocky, Galician southern coastline stopping to visit the quaint seaside village of Baiona for a walk around the village with an important historical past since the first word of the discovery of the Americas came into the bay on La Pinta en 1493. Then we will return to Vigo. This tour can be done private or join a small group (4 people min. to 16 people max.) where available on certain dates. A day packed full of contrast walking, exploring and tasting the local wines! Your private English-speaking driver and food & wine *guide will pick you up at a city centre hotel, cruise port, airport or train station. First we start off by driving by road down to the O Rosal valley famous for it´s Abariño white wines. We will enjoy a guided tour of one of the top Albarino winery Bodegas Terras Gauda in the area as well as a tasting of their fine wines. Then we will make our way to the Southernmost point of Galicia´s Lower Rias Baixas , where we will then follow up the picturesque coastline stopping at the pretty village of Baiona. Here we will visit the Castle of Monterreal which is now a fabulous Parador hotel and offers amazing views of the coast. This village is also a very important yachting port and also witnessed the arrival of the Caraval Pinta bringing the word back to Europe of the discovery of the Americas in 1493. You have some time on your own to walk around the Old Town streets or the maritime walk of the Parador. Continuing up the coast we will arrive back in Vigo. You Driver and Guide will drop you off back at your hotel, cruise ship, train station or airport and say the final goodbye. If you like you can add on a, optional traditional seafood lunch at the port of Vigo before you go back on the ship which is right walking distance away from the terminal. Transportation in Sedan Car (eg. Mercedes E-Class or smiliar sedan) for 1 to 2 People, Minivan (eg. Merecedes Benz Viano or similar van) for 3 to 7 People. Larger groups will be in Minibus (Mercedes Sprinter or similar minibus) 8 to 16 seater Fully equipped buses. English-Speaking Driver in Sedan Car and Minivan, Spanish-Speaking for Minibuses but we included our English-Speaking Guide on groups of 8 or more people. Other pick up locations available on request from surrounding towns of Vigo.